Thirty-two miners were confirmed 32 dead Sunday in the second coal mine blast in a week in China, state-run media reported. The gas explosion hit the mine in Chifeng city in the Inner Mongolia region midday Saturday. 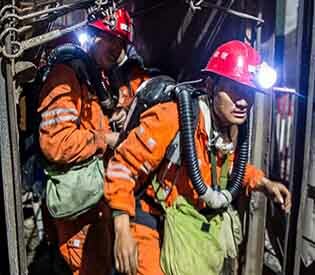 Out of 181 miners working underground, 149 managed to get out and the rest died, official Xinhua News Agency reported. The mine was operated by the Baoma Mining Co. Ltd., Xinhua said. News of the blast came just hours after 21 miners who were trapped for four days after an explosion hit their unlicensed coal mine were confirmed dead in northeast China’s Heilongjiang province. Four people were arrested in connection with that disaster. China’s mining industry has long been among the world’s deadliest, and top work safety regulators have acknowledged that some mines cut corners on safety standards due to financial pressure.